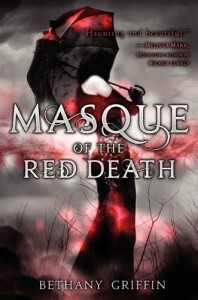 I was surprised how much I enjoyed Masque of the Red Death. I admit that I mostly bought this book for it's cover, and wasn't at all impressed by the synopsis. However, the writing, story, and narration were fantastic. I am eagerly anticipating the second book. The main character, Araby, is a believable and refreshing character. She has a story behind her, and one to come. Her voice develops the story to a beautiful novel. There is a fine line between a tragic, realistic, raw narration and a plain irritatingly broody and whiny one. Thankfully, Araby, and all the characters in the story, are the first. I hope in the second book the author keeps the lines just as clear. The disease was very interesting, unlike what I first though. It is not just another illness and cure story. There is more than that! Ohhh! I get excited just thinking about the plot in this book! It twisted and amazed me throughout the entire story! Bethany Griffins imagination is incredible. Sometimes I thought things seemed a bit rushed a the end. It kind of took a quick turn and then ended. Needless to say, I wasn't the biggest fan if the end. However, it did make me immediately add the next book, Dance of the Red Death, to my to-read list on goodreads. As of the love interests, Will and Elliot, I am not sure which team I am, they both have these major faults... But are still amazingly written and I liked them anyway. April, Araby's friend, is another broken character done well. She is maddeningly realistic. She hides behind a pretty dress. But she is still very strong. Overall, I would recommend this to fans of imaginative, beautiful writing. Griffin keeps you on the edge of your seat in this gripping tale! P.S It is a little depressing and dark, but in a well written way, that has you glued to the pages. It adds to this book's charm, unlike other books I have read. Masque of the Red Death is a treasure of a book.